When I thought of writing this article about low carb options in fast food restaurants, I had to put a lot of thought into how I would divide up the choices. Would I list all the low carb options at fast food restaurants by restaurant name? Maybe by which protein you’d choose? 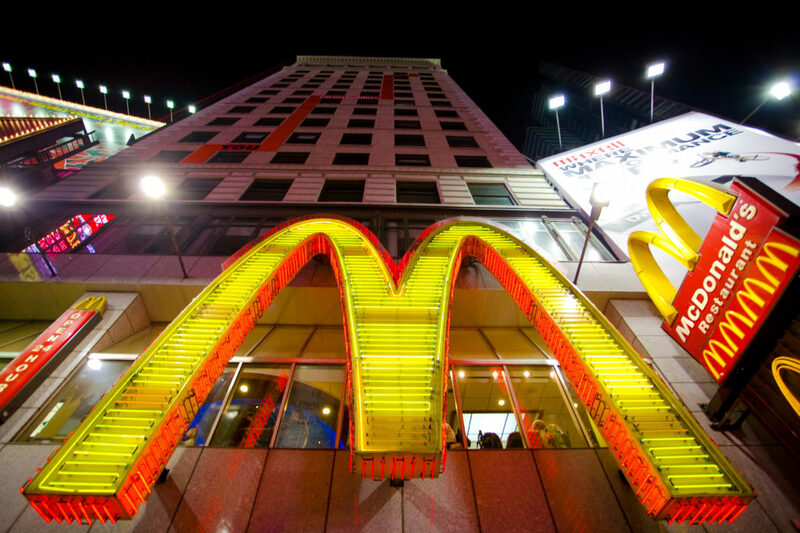 I just guessed, So I picked a handful of national fast food restaurants like McDonald’s and Subway. I’ve decided to list the foods by the chain they come from. 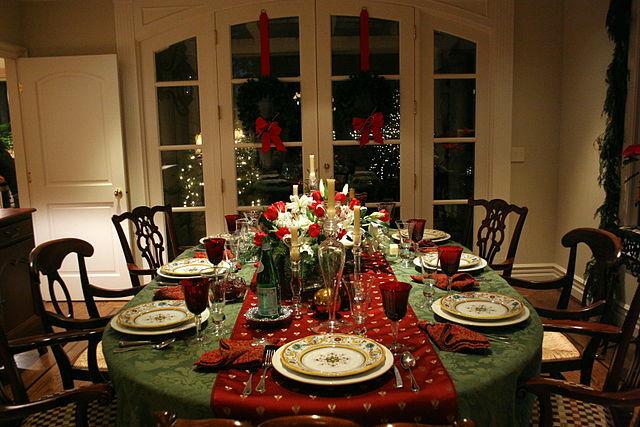 The links included in this article are to that company’s nutritional information page. Some of these pages even allow us to play with our food and not get our hands slapped! Some companies have made it kinda fun to calculate what we are going to eat. Others just provide a list. Experiment and find an item that you can enjoy! Chicken, Beef, or Steak? What Kind Of Food Do You Want? Yes, it’s Taco Bell that asks this question, but one that you need to ask yourself BEFORE you even choose the restaurant. 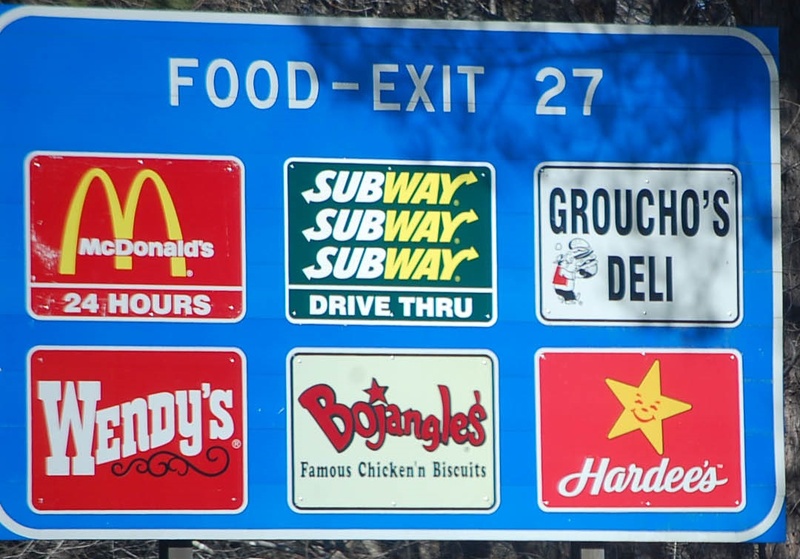 Of course, with most communities having many fast food choices (Here, in the Houston area, it’s CRAZY), you don’t have to just choose between these meats. You can also choose from turkey, shrimp, fish, pork and other mixed meats like salami and pepperoni. And there’s always cheese! All of these products are Low-Carb foods. It’s what they add to them (or put them in) that can ruin a low-carb diet. Knowing what simple options are available to you is your best defense against temptation. Having someone else pick it up for you might be the second best defense against temptation! Just about every restaurant will be happy to serve low-carb versions of their foods, if you ask, by simply putting your sandwich in a dish rather than a bun and it’s worth saying that eating this way is not a bad option. I’m a little self-conscious, though, and I start thinking that I should just dine at places that have low carb choices on their menu. If they aren’t there to service me, why do I want to give them my money? 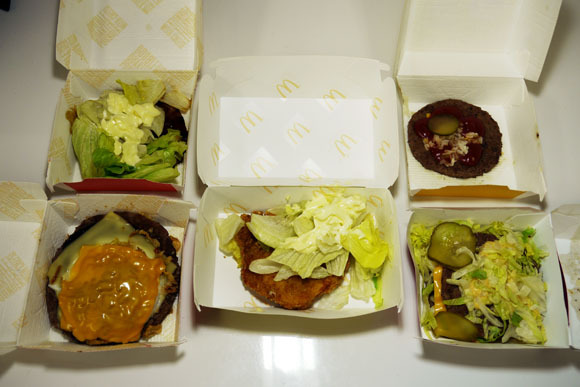 Before your eyes are five different McDonald’s burgers with no bun. Seriously. If your friend calls and says they are stopping by Taco Bell on their way over and asks if you want something, do you really want to go down the list of customization that you have to make in order to eat a food? Does your friend want to go through that in the drive-thru? Probably not. So I’m going to cover MENU FOOD items. I will also include some menu items that work if you hold ingredients. I don’t even want to get into substitutions because ordering needs to be simple. Dieting is hard enough! And just to be clear, we are eating 3 times per day. 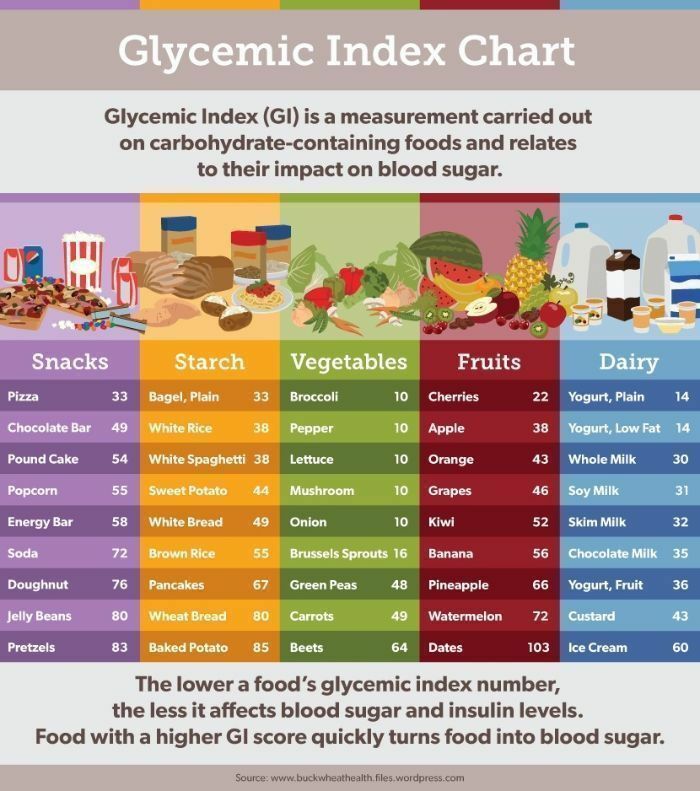 I am eating 30 carbs or fewer per day, so for this exercise, 10 grams of carbs or fewer equals low carb. I only count NET CARBS. Wow! 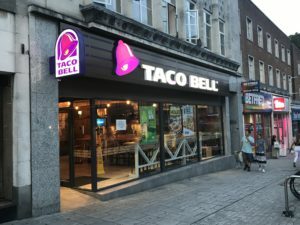 Another Taco Bell idea…funny thing is that, if you’re thinking outside the bun and you’re on a low carb diet, Taco Bell doesn’t have a single low-carb food option on their menu. Not one! There are, though LOTS and LOTS of choices if you hold the tortilla, beans and rice, but then it’s become Bowl Bell. These are 11g carbs each. You know, if Taco Bell would offer their items in low carb tortillas, many pared down items would be low carb AND still feel like a taco or burrito. They haven’t figured that out. 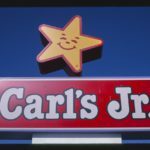 The first fast food chain to zero in on the deiting lifestyle of Americans and offer a low-carb menu item was Carl’s Junior. Hardee’s, a very similar restaurant owned by the same parent company also has low carb items. Now, I meet a lot of people who say that these two restaurants are the same. I mean, they use the same star as their logo, but this little article will point out that they carry different menu items. On Carl’s Jr.’s “Other Side” menu (Which used to be much stronger), you can find what used to be called “The Low-Carb Six-Dollar Burger”, but then they got to actually be six bucks, so they changed the name. (I’ll tell you this. This is a lot of food I loved this meal before my surgery. Now it would take me three sittings to eat it all). Toldja they aren’t the same! You can also order any sandwich without the bun. That will save you a LOT of carbs! I want to be fair here and tell you that the two other burger giants, Burger King and Wendy’s (#2 and #3, respectively) have some low carb offerings. Follow their links by clicking their name here and check out their menu items! Wanting to write about different low carb options, I wanted to discuss sandwich places in this article; namely, Subway and Arby’s. 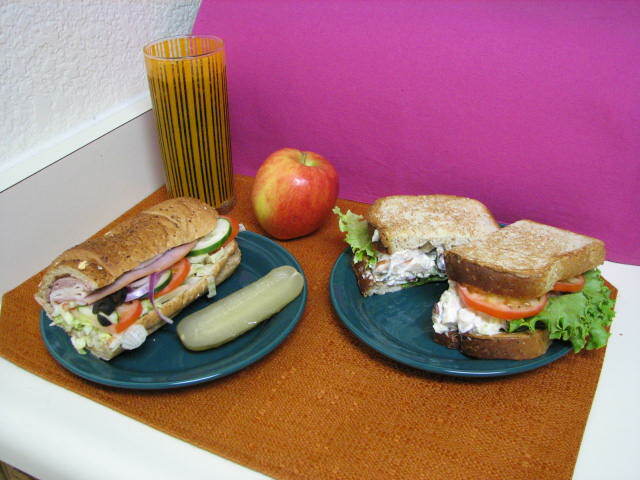 Two sandwiches; on the left a Subway club, on the right an Arby’s chicken salad sandwich. One of these can be made into a fantastic salad! Subway offers more choices than any other restaurant discussed here. Though all of these items are salads, I can assure you that they are delicious. I’ve had the BMT Salad and the Spicy Italian Salad. These are pretty big salads and will hold you like the sandwich would have, only, without the carbs, it will probably hold you longer. I like to break this salad into two or three meals. 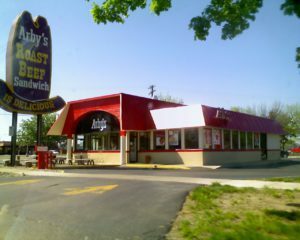 Let’s head on over to Arby’s to see what we can eat over there! By my standards, Arbys, like Taco Bell, doesn’t have any low-carb menu items, but they will be happy to make a “Bunless” version of whatever sandwich you want. Arby’s has meats! (That should be a slogan!) Not just roast beef! Nothing screams out “Low Carb” louder than meat, right? So go out, get yourself an Arby’s sandwich, sandwiched between some kind of lettuce. I’d stray away from the “Arby-Q” sauce because it’s sweet, but you can have just about every sandwich in their arsenal without a bun and stay low carb. The first time I was low carbing, I had lost just under 80 pounds when, one day, my car overheated in ALMOST the middle of nowhere. I didn’t have any low-carb foods with me, but a quick look around and I found I was within walking distance of a Taco Bell. I wasn’t armed with all this information. Ordering low carb stuff seemed impossible and well, from Taco Bell, it was! Now that you have this information, you can apply it to other restaurants. There’s no need to go look at every restaurant’s nutrition list. Ask for a cheeseburger without the bun, Ask for a salad with either Ranch or Caesar dressing, or ask for your sandwich to be rolled up in lettuce, But whatever you do, STAY LOW CARB and avoid car breakdowns near taco restaurants. Great article. Speaking as a Fibro sufferer I can tell you that chasing down Low carbs in UK chains is even harder over here. LOL. In fact the best option over here is Subway, other than that it is a british way not to ask, not to fuss. And even if you do, the customer service over here is to make you uncomfortable about challenging. That’s unfortunate. I had no idea that it is in your culture not to ask for changes. I think Subway’s the best choice, by far, anyway. Their salads taste just like their sandwiches, with no gas! I liked your post and am not on a low carb diet but do not like to eat much bread, so I am going to try the salad at subway next time. I was not sure how good it was, but now I will try, as it sounds good. Thanks! Like I said, if you like a subway sandwich, you will love their salad. Tastes just like the sandwich without the guilt-conscious bread. Thanks for the comment! I hope so too! This is great information when traveling. I try not too eat at any fast foods when close to home. When ordering my meal at any fast food place, I tell them how I want it, I think in the future I will look at not getting a bun . I always go inside even if I am going to keep going when I get my food, this way I can check my food to make sure it is correct before I leave. Those are great ideas, John! Low carb versions of burgers are a little more risky to eat while driving because there’s no bun to soak up grease or water from the produce, so they can be a bit drippy. Those that are served the way McDonald’s does it (in a tray) typically need a fork. But in a pinch (pun intended) I’ll eat the patty and produce with my fingers when I really have to keep moving. Nice Article, My partner and I were discussing this exact topic when deciding what to eat last night. I think people would be surprised at how easy it is to eat low carb when they are out. Whats is your go to Low Carb Take Away ? Thanks Carl! My low carb take away is the Carl’s Jr. low carb thickburger. If I’m on the road, I don’t concern myself with what I can’t eat, but if I am just going to grab a bite, I can easily make two, sometimes 3 meals out of one of these, depending on what time of day I eat. was curious what you think about this topic and wanted to get some input on it. Even though I am not the typical fast food guy I like burgers. But as I want to lose weight “on the way” by simply re-arranging my habits from not as good to better, your post gave me some “hot spots” to look at. since you’re a burger guy, I absolutely recommend the Carl’s Jr. or Hardees burgers. You can have any of them done on a lettuce wrap and that will cut around 30 carbs. The low carb thickburger at Carl’s is the best choice by far. 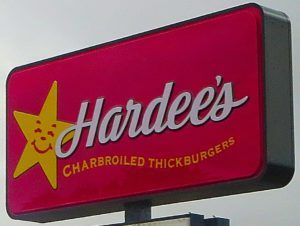 I’ve eaten at Hardee’s in the past, but I have never tried their low carb menu. Hardee’s has the best low carb menu, though. If I get up North from here, I will try something from there.